The case for Bombing The Syrian Government! 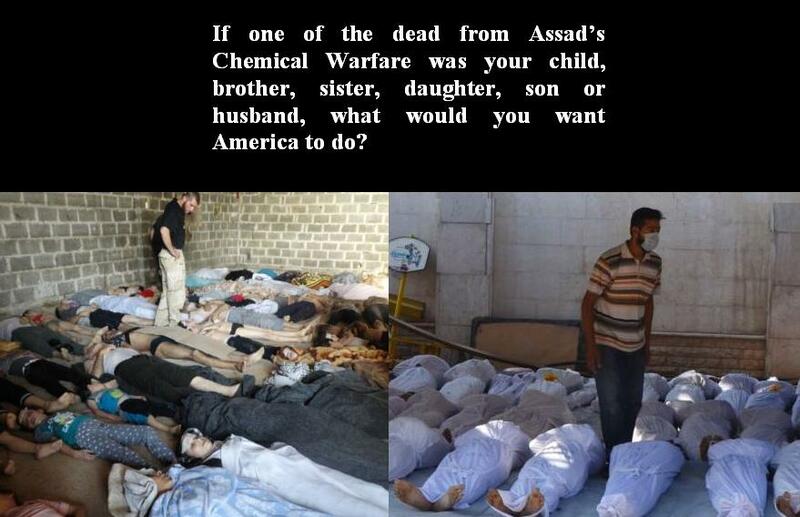 The Proof of evidence that warrants bombing Syria are the thousand plus dead women, men and children from chemical warfare that is indisputable. For those who have always wanted to belittle Obama and the Democrats that are most of the time “spineless,” if we, who are always claiming to be the Leader of the World and are always perpetuating Human-Rights, Democracy and Freedom for all just sit by and do nothing, then, the worst is yet to come. And it wouldn’t only be in and from Syria, but Iran, North Korea and the disenchanted and envious South American Countries that are buttressed in their hate for the United States, by our nemesis, CHINA and Russia! Both China and Russia are no friends of America, they are ruthless to their own people and the only agenda on their minds “is the overloaded avarice for power to usurp the United States.” God help us all if they ever achieve their goals. As Dr. Martin Luther King Jr. so eloquently stated; “injustice anywhere could become injustice everywhere!” The Talking-Heads in the media and the always whining disrepute should just shut up and allow the President and his Military Advisors to handle this matter. Since becoming President, Obama has always shown himself to be the reluctant warrior and seeks no fanfare of warmongering. It is insane to compare former President George W. Bush with President Obama! 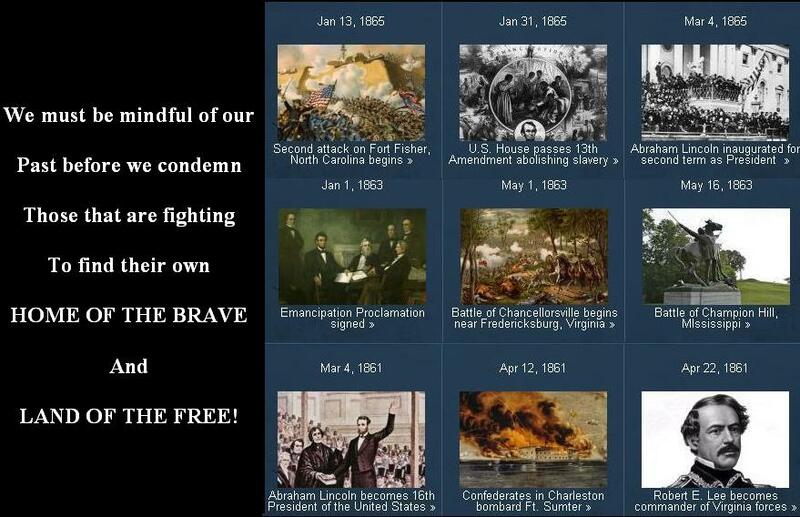 Bush threw us in unforgiving waters and Obama threw us the lifeline and rescued us! 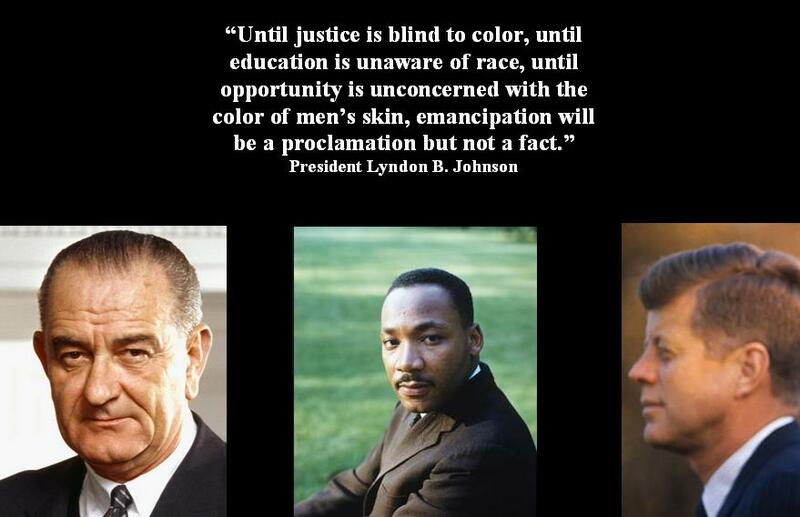 We cannot deny that there isn’t still a race problem in America, but we also cannot deny that we have made enormous progress! Despite all of America’s imperfections, she still stands at the top of the Pleiades of Nations. Former President Abraham Lincoln was quite honest when he said that; “He did not control events and that events control him.” As it was for President Lincoln, for the most part it has been the same for the former and present Presidents. We all must be mindful that History does not adhere to our anxiety of timing, but rather, it lends itself to its own pace. American History cannot be studied backwards, it must be dwelled upon in the present, encompassing, all of the past as a guide to the great ongoing journey of American History. On this great day; the 50th Anniversary of the greatest speech of the 20th Century, Dr. Martin Luther King Jr., “I have a dream” speech, will always be a work in progress. If we awake from that dream, then we would be subjected to the loss of hope for better tomorrows for the present and future generations! In his father’s anger the child lost four fingers; in his father’s remorse, he committed suicide! While a man was polishing his new car, his young son picked up a stone and scratched a line on the side of the car. In anger, the man took his child’s hand and hit it many times; not realizing he was using a wrench. At the hospital the child lost all four fingers due to multiple fractures. When the child saw his father with painful eyes he asked, “Dad, when will my fingers grow back? The father was so hurt and speechless he went back to his car and kicked it several times. Devastated by his own actions sitting next to the car he looked at the scratches; the child had written; “LOVE YOU DAD.” The next day the child’s Dad committed suicide. It may be a blessing for us to remember to watch our thoughts for they become words; watch our words for they become actions; watch our actions, they become habits; watch our habits for they become character and we must watch our character for it becomes our destiny. 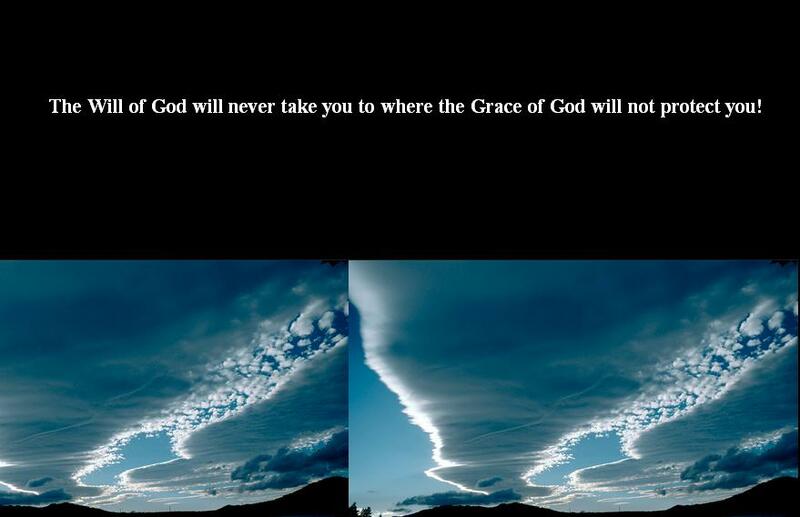 The Will of God will never take you to where the Grace of God will not protect you, so, the best use of life is love; the best expression of love is time and the best time to love, is now! 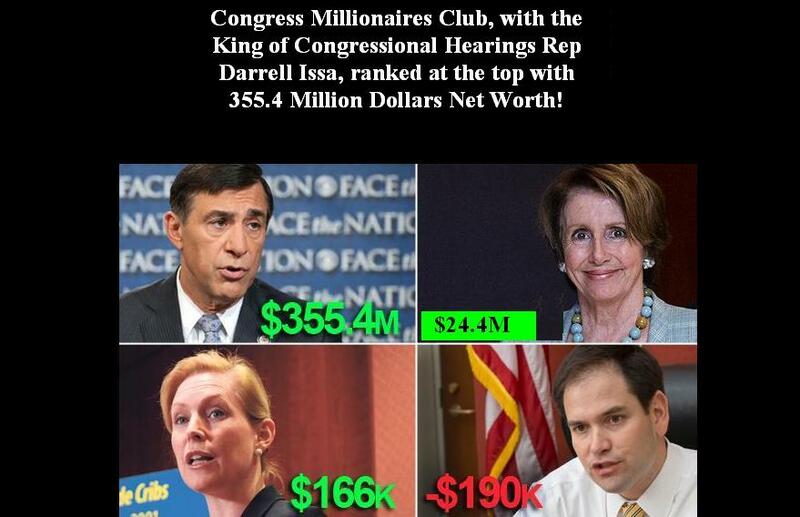 Millionaires in Congress with Darrell Issa ranked the highest with a Net Worth of 355.4 Million Dollars! However, some in Congress are middle class. Some in Congress are too busy filling their pockets, hence the reason why the American People’s wellbeing is of no interest to these avarice ridden despots! However, some in Congress are middle class but we can’t be sure that when they get into the Millionaires Club, whether nor not they would still care as they do now! Republican Rep. Darrell Issa topped The Hill’s list of the wealthiest member of Congress with a fortune of $355 million to his name. With multimillionaires among the lawmakers walking the gilded halls of power, it leaves others like Sen. Kirsten Gillibrand, D-N.Y., labeled “as barely in the black” with a net worth of $166,000. Swiss apologize for encounter Oprah Winfrey calls racist! Billionaire media mogul Oprah Winfrey says she ran into Swiss racism when a clerk at Trois Pommes, a pricey Zurich boutique, refused to show her a $38,000 handbag, telling one of the world’s richest women that she wouldn’t be able to afford it. Winfrey earned $77 million in the year ending in June, according to Forbes magazine. She brought up the incident during an interview about her new movie, “Lee Daniels’ The Butler,” which opens next week and focuses on civil rights and race relations in the U.S. She was asked to open up about her own experiences with discrimination. Swiss tourism officials and the boutique owner were quick to offer apologies Friday. “We are very sorry for what happened to her, of course, because we think all of our guests and clients should be treated respectfully, in a professional way,” Daniela Baer, a spokeswoman for the Swiss tourism office, told The Associated Press. The tourism office also posted an apology on Twitter, saying, “This person acted terribly wrong.” The newspaper Blick described the bag as a crocodile-leather Tom Ford design named for actress Jennifer Aniston, a fan of the American designer. It quoted Goetz as saying the bag was priced at 35,000 Swiss francs. Boutique owner Trudie Goetz told Swiss public broadcaster SRF that she believed the incident was a misunderstanding when the store clerk, who is mainly an Italian speaker, explained how expensive the bag was. Goetz added that “I believe she rather said something like ‘we have some less expensive’ — ‘we also have some less expensive bags’ and not ‘it’s too expensive for you.’ ” Winfrey was in Switzerland to attend the wedding of her longtime friend Tina Turner, who has lived in Zurich for many years and has been quoted saying how much she enjoys living among the Swiss. Turner was granted a passport earlier this year, a process that typically takes years. The nationalistic Swiss People’s Party, which has the largest number of seats in the federal parliament, has won support through claims that immigrants can bring crime and social problems to a country that has been an oasis of stability even in Europe’s darkest days. In recent years, the People’s Party has successfully campaigned to ban the construction of minarets in a country that has about 400,000 Muslims, and to tighten the nation’s asylum law. Swiss lawmakers also narrowly rejected a proposal to ban veils worn by some Muslim women in public. And this week, a row broke out over plans to bar asylum-seekers living in the small town of Bremgarten from visiting public swimming pools and attending schools. Human Rights Watch said the agreement by the Swiss migration office to let the town impose “house rules” to limit access to schools and sports facilities violates international law. It wasn’t the first time Winfrey has taken issue with treatment at a ritzy European boutique. In 2005, she was turned away from a Hermes shop in Paris 15 minutes after closing time. The store said it was closed for a private event. A Hermes executive appeared on Winfrey’s talk show to apologize for the “rigid and rude” behavior of the employee. Winfrey complimented Hermes on its response — including sensitivity training for employees — and urged viewers to buy the company’s products. In “The Butler,” Winfrey plays the wife of a butler who is a witness to history, from the cotton fields of Georgia to the White House. It is based loosely on the career of Eugene Allen, a black man who served as a White House butler from the Eisenhower through Reagan administrations. During the TV interview, Winfrey said that “true racism is about being able to have power over somebody else,” and that she sometimes encounters it along with sexism in boardrooms. Then she recounted the incident in Zurich while she went shopping alone. 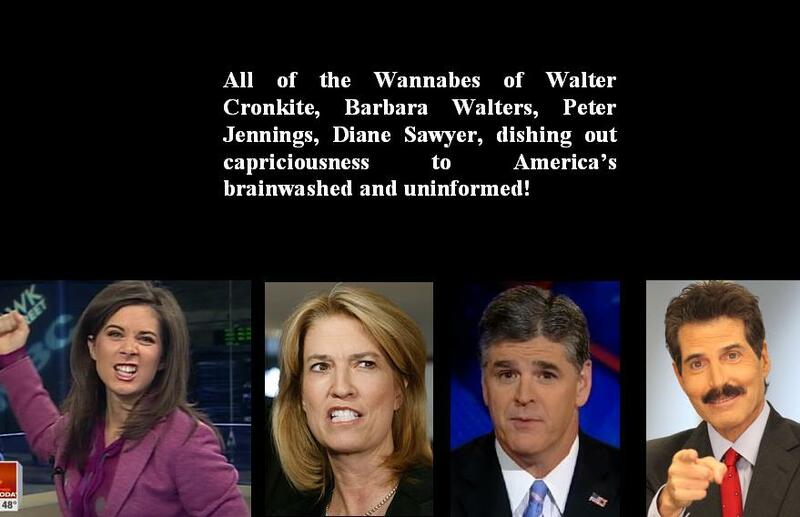 “Obviously, ‘The Oprah Winfrey Show’ is not shown in Zurich. So this doesn’t happen to me unless somebody obviously doesn’t know that it’s me,” she said. A spokesman for Zurich’s tourist office, Christian Trottmann, called the incident “very regrettable” and said it obviously hurts the image of a friendly, world-class city accustomed to different cultures.